Don’t judge the pedicure. It’s hard to do anything when you’re not supposed to wiggle your toes, so that’s my own handiwork (or lack thereof). But look, ma, NO BUNION! I know you’ve been just sleepless wondering how my bunion journey is going. So, here, I’ll be like an Ambien, and tonight you’ll rest easy. Today is day 21, yup, three weeks, since we broke the foot, added the screw and said buh bye to that nasty bump that was the size of my head. I am still lugging around the attractive and stylish boot, but now I can sleep without it, which is a big, fat sunny day. And speaking of big and fat, I have been on a diet of potato chips since I was de-bunionized. Half the time, I am walking around with potato chip dust on my shirt. This has got to stop. And soon. My foot looks pretty good, considering. 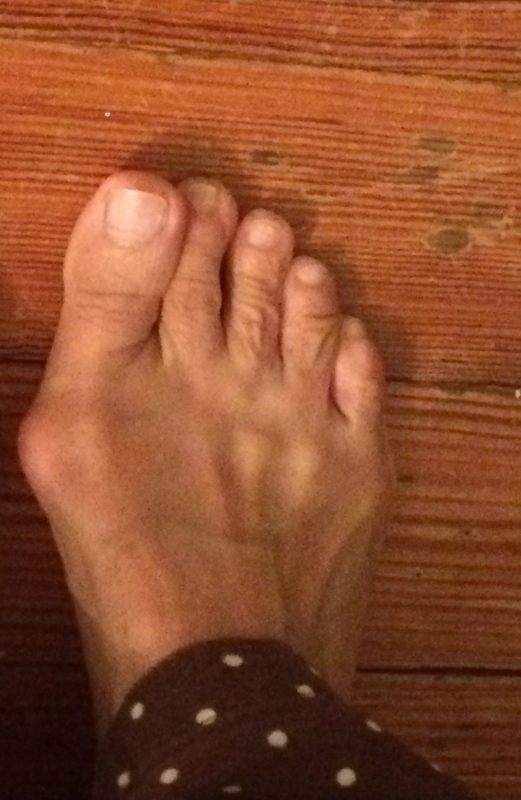 I mean, the bunion is really gone, which is actually hard for me to believe. This thing, that became even bigger in my head, and caused the kind of fear that nuclear disaster incurs in most sane folks, is really gone, and with it all the worrying I did about it. I was really convinced for many years that if I had this surgery, I really might never be able to walk again. I’d gone to many doctors and none of them were encouraging about how this thing could go down. The horror stories on the internet all seemed to be penned by Stephen King. I worked myself into a panicked frenzy about this surgery, all the while having less and less function in my foot. There seemed to me no good way out. And it caused me a huge amount of internal stress, and fear about my being able to be active for the rest of my life. So, actual surgery aside, just the fact that I was able to make the choice to have this surgery, and take this chance, has freed up a significant area of my brain. It’s sort of amazing, really. I might be able to learn some new stuff with all that space. And here’s the thing that’s even more amazing. I am terrible at trying to stay in the moment. It’s something that I have been working on for like 20 years. I am a horrible meditator, because I am wondering if I can jam 20 minutes into 15, and I have a difficult time with all the stuff that keeps parading through my mind while I’m trying to shut it off. But this surgery, this surgery has FORCED me to stay in the moment, which I’ve been doing pretty successfully. I have been taking it a week at a time, measuring the small successes and changes and doing something that I never do, NOT THINKING ABOUT THE FUTURE. I mean, I am to some extent, but really, I’m letting it play out daily, grasping each day’s changes, and trying to stay right there in it. See, the thing here is that yes, the bunion is gone, yes I am doing well, no infection, getting more and more mobility, but I have yet to walk on my real foot, sans that sad looking boot. That will be when I will really know if this thing has worked. This was not a surgery so I could wear cute shoes (but GOD KNOWS, it’s a nice side effect and I am perusing shoes online every single day), but a surgery for function, a surgery that will make my foot work again, the way it hasn’t been able to for a good long time now. But this lesson I’ve learned about the present, from my wonky foot, is an incredible side effect, and not one the doctor told me about! As far as the physical health of my foot, so far, so good. My ankle is now loose and freely moving around. The discoloration and black and blue’s are almost gone. My swelling is minimal, but so is my walking. I have chosen to be a right wing conservative with this thing. I am not overdoing it, not pushing it, but instead allowing it to heal properly. I didn’t go through this to mess it up now, just because I am tired of not being able to do much walking (not that I am not BORED OUT OF MY EVER LOVING MIND, OR DYING TO COOK A DESCENT MEAL WITH A VEGETABLE OTHER THAN POTATO CHIPS IN IT). But let’s face it, what’s a few months, when it comes to something that’s practically gobbled up your soul for the last 10 years. Next week, the boot is history, and physical therapy begins. This is when I’ll find out if I’m going to be a couch potato for the rest of my life, or an active member of society. I’m hoping it’s the latter, but we’ll see. Either way, I had the surgery, I was able to make a choice and able to learn a thing or two about being present, and not projecting. Who would have thought that miserable bump had anything to teach me?